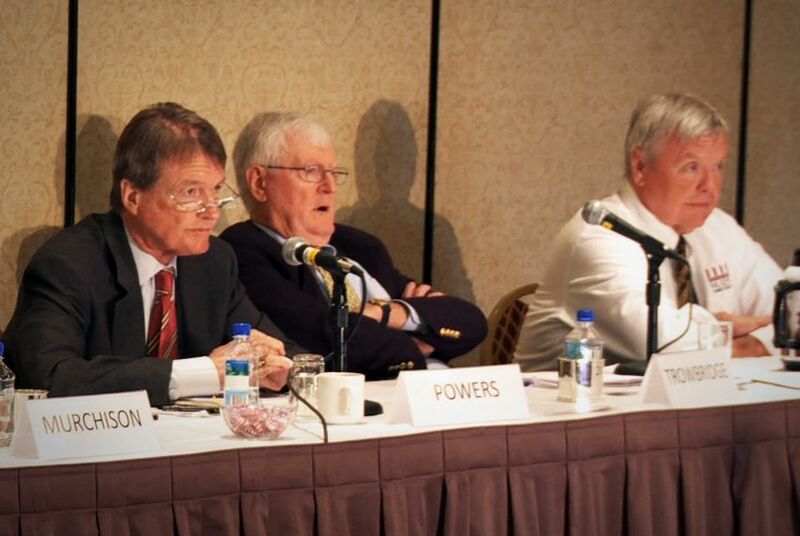 At a panel hosted by the Texas Public Policy Foundation today, Bill Powers, the president of the University of Texas, and Robert Strawser, an accounting professor at Texas A&M University and the speaker of its faculty senate, responded to the conservative think tank's proposed higher education reforms. The ongoing debate about TPPF's "breakthrough solutions" for higher education and the vocal resistance to them by the UT community has been at times very tense. That was reflected in today's panel discussion, during which a defense of the reforms was mounted by Ronald Trowbridge, a senior fellow at TPPF and a former vice president of Hillsdale College in Michigan. The following is a play-by-play of the discussion. Powers began his remarks by enumerating the areas in which he and the TPPF agree. "We need to change," he began. He said that UT talks about productivity on campus a great deal and that the "change needs to be student-focused and student oriented." He added that many accreditors, such as the Southern Association of Colleges and Schools, focus on student success and student outcomes. "The big bulk of what we do is undergraduate teaching, and that needs to undergo revision and change as well," Powers said. "If the issue is change, we embrace it and have been doing it for a long time." On the subject of accountability in teaching, Powers said, "We absolutely have it." He said there are professors who don't get tenure at UT because of their teaching and that student evaluations are used to judge teaching. Powers said they "aren't perfect, but they are a quite good guide." He noted that much of the debate, especially among faculty members, centered on a "red and black report" generated by the Texas A&M University System to track revenue generation. The report drew the ire of the Association of American Universities, of which A&M and UT are members. He said the AAU's concerns, and his, were that the document did not account for "the societal benefit of the research that's done and the teaching in that kind of research setting that our students get." Powers' remarks were followed by those of Trowbridge, who said he knows higher education from "every conceivable angle." Although he is retired from academia, Trowbridge has delved into the current debate — even writing a guest column for The Texas Tribune — because, he said, "if I see an idea that I have to challenge, I will set aside my vodka and my cigar and go after them." Trowbridge was especially upset about the treatment of Rick O'Donnell, who received a high level of media scrutiny and was ultimately pushed out of the University of Texas System after a brief tenure as a special adviser. "I want what was done to Rick O'Donnell and the scrutiny there to be put right back on Powers and Strawser and the trustees and the governor and everybody in this state. I want it to be an open act of honesty and debate," Trowbridge said. He said he did not disagree or take issue with any of Powers' remarks to that point but believed the problem was "much wider." "Our universities have shifted priorities to research first, students second," he said. Parroting his Tribune column, he cited a study showing that, from 1980 to 2006, a total of 21,674 scholarly articles were written about the works of William Shakespeare and asked, "Do we really need the 21,675th?" He noted that many professors are earning salaries higher than that of the governor of Texas. Changes need to be made, he said, but they cannot be made by the likes of Powers and Strawser. "It has to be done by the regents or trustees." Their job, he noted, was not to be cheerleaders but to govern. After Trowbridge concluded, Strawser began his presentation by noting that Trowbridge had observed he was the "moderate" on the panel. And yet, he said, "I agree with almost everything Bill said. I agree with almost nothing Dr. Trowbridge said." Strawser congratulated Powers and the UT community for responding to the reforms. "We have not heard as much from A&M, at least not publicly," he said, noting that he intended to change that. The problem that needs to be addressed, Strawser asserted, is a lack of understanding about what the goals of Texas' universities are. "The issue we ought to be debating," he said, "is, Should these be the goals?" Strawser said he supports most of the seven "breakthrough solutions" — especially measuring teaching efficiency and effectiveness and publicly recognizing and rewarding teachers. He agreed that evidence of teaching should be required for tenure. But he believes A&M does all of those things already. What about the idea of separating teaching and research budgets? "I think teaching and research are inseparable," he said. What of the proposal to use results-based contracts with students? "I'm not certain what that means," he said. He concluded by thanking the TPPF for sparking such an "essential" debate. "It does us no good to write white papers," he said. "We have to debate. We have to get together." During the question-and-answer period from the discussion, Powers said he shares the concerns of alumni who vocally opposed O'Donnell's employment. Trowbridge wondered why, if everything was so good at A&M, they were so concerned about the "red and black" report. Strawser replied that the notion that faculty at A&M are not evaluated by other measures is "an outright fabrication."